Mantids - Organic Control, Inc. THE COOLEST CHARACTER IN YOUR GARDEN! Life Cycle: Praying Mantids hatch out of their egg case (ootheca) along the seam that looks like louvered windows with some mud packed on top. They hatch in the spring when the weather warms, the warmer the temperature, the sooner they hatch. Unlike most insects the mantids do not hatch as larvae, they emerge as miniature adults, about half an inch long. They will grow through spring and summer until they reach a length of 5 to 6 inches, shedding their skins several times. Although mantids have wings, they do not use them until fall when the female wings develop and she begins flying around looking for males to mate with. After mating, she eats the head off the male, which helps to nourish her eggs. She then attaches the brown foam to a branch, lays her eggs inside, and dies shortly afterward, The eggs are protected from the winter cold in the foam and the cycle begins again in the spring. General Information: When the eggs hatch the egg case does not change in appearance except for what looks like a little sawdust hanging from the seam. Since the Mantids do not move much and blend easily with their surroundings, it is easy to miss the hatching. While most insects are constantly searching for food, Mantids are content to stay in one area and wait for their food to walk by and grab it with their strong forelegs. This is why they are good to use early in the season, before there are pest problems, and use other insects after pests arrive. Praying Mantids eat a wide variety of garden pests. In their younger stages they eat aphids, thrips, flies and maggots, small caterpillars, leafhoppers, white grubs and other soft-bodied insects. Mature Mantids feed on larger caterpillars, earwigs, chinch bugs, sow bugs, beetles, grasshoppers and other large insects. Release: You can keep the egg cases in the cup, set them on a window ledge or in the patio until they hatch. 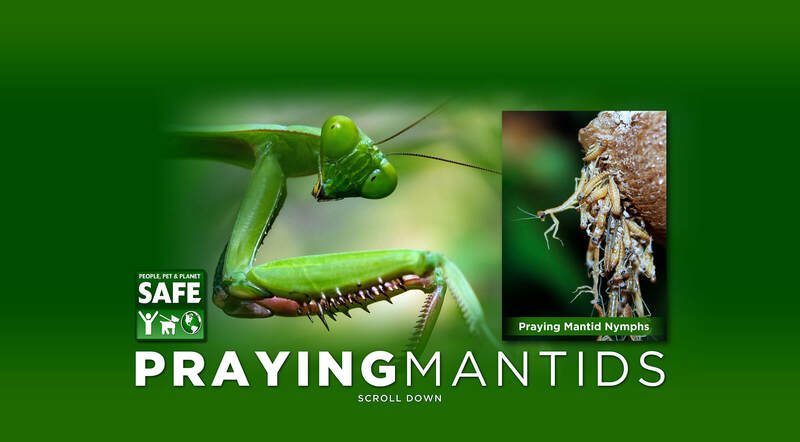 As soon as you see tiny praying mantids emerge remove the lid and sprinkle the mantids around your garden. Or put the egg case in a bush, hedge, limb or anything more than two feet above ground. The egg case may be inserted in the fork of a branch or hung with a piece of string or needle and thread rum through the outside of the case. Hanging will help keep birds and rodents from eating the eggs in the case. If ants are in the area, oiling the string will help keep them away. Now that you’ve learned more about praying mantids, it’s time to add these wonderful insects to your garden. Like all beneficial insects, you can be sure that they’ll dine only on your garden’s pests and won’t harm the good bugs or your plants. Use our dealer locator to find a store near you!